Aquascape of the Week: Pele's "Oshun"
It's been a while since I've seen an aquascaped aquarium use plants so effectively to make "hills" of green. The way Pele has trimmed and propagated these plants is simply amazing. I have yet to get any of my stem plants to grow this dense and lush. This is also a fairly small tank (about 30 gallons) but it looks much larger, helped by the use of plants with small leaves. The red Ludwigia in the center-right forms a perfect focal point as well. For more information on this tank, check out the thread. Thanks to put my tank in your blog!!! Excellent use of plants with the aquascape. 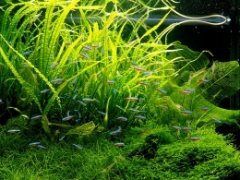 Aquascape of the Week: Nico's "Douce Ambiance"